It's depressing to thing that we are almost exactly half way through what has been a rollercoaster of a season. The lockout rust has been knocked off, the defenses have caught up with (most of) the offenses in the league. Some teams have fallen hard while others just continue to rise (Just give coach of the year to Jim Harbaugh already). There's shocks out west, up coming titanic clashes in the north and one or two important games for the much maligned residents of up state New York. So let's crack on and get right into them, the GREATEST power rankings you'll ever read. Fact. Are we going to see a repeat of last year's Super Bowl? Looks that way right now. There’s very little to say about Green Bay that hasn’t already been said. They’re fantastic. Sure Minnesota gave them a bit of a rough ride but they never looked like losing that game. Aaron Rodgers has so many weapons it’s embarrassing. People are already discussing the 19-0 potential of this side, something Toby's not very happy about, but it's almost impossible to see who can keep up with them right now. Reports of their demise were greatly exaggerated. Toby kept the faith, having put the Steelers #2 in every ranking we’ve done here. They got the Brady monkey off their back, giving the Patriots defense a good seeing to on Sunday, making them THE team in the AFC this season. Next up are the Ravens, and revenge is in the hearts of Steelers after the week 1 embarrassment. There are a lot of injuries to overcome, especially at linebacker, but these guys are out for blood. Mike Wallace is becoming a complete WR too and is ably accompanied by Antonio Brown and Emmanuel Sanders. Ben's got options when he drops back now. If he can get the time that is. Ryan Fitzpatrick got a much deserved new contract, but that might irk the real cog of their offense. Fred Jackson is still sat on $2million a year, with 2 more years to go on that deal. The right thing to do would be to keep him happy, after 150 total yards a game should never be sniffed at. Marcell Dareus, the #2 pick in April, is starting to flex his muscles and show what he can do too. Could they possibly take the AFC East?? Their fate is in their hands with 2 games vs the Jets this month. At 6-1, some would say they should be higher. But that would have physically hurt Phil. It’s hard to be convinced by a team with Alex Smith at QB, especially as they rank #31 in passing yards, but he’s not been making the mistakes of previous seasons. And a lot of that has to do with the impact of Jim Harbaugh. He mind wind some other coaches up with his enthusiasm but he’s got this squad playing with real fire, especially on defense.Their schedule looks pretty easy going in, and with such a big lead in the NFC West already, they look pretty good for the playoffs, as well as a bye. The Patriots have quietly had some very bad drafts recently, and it’s really hurt their defense. Devin McCourty, after an impressive rookie campaign in 2010, has disappeared and is powerless to break up passes now. All you need to know about the Pats can be summed up by looking at their 3 leading tacklers: Pat Chung, a safety, McCourty and Kyle Arrington, both cornerbacks. Brady is still fantastic, while Welker and the tight ends cause all kinds of trouble. But if their defense can’t get off the field against a good team (Pittsburgh had 39 minutes of possession) then they won’t go very far. They've got the chance for some revenge on sunday against the Giants, and a fired-up Tom Brady is still every defenses worst nightmare. The Lions defense toyed with the Broncos like a child plays with its food, but after their bye they’ve got 3 big tests coming up. A trip to see Brian Urlacher’s band of angry Bears and the challenge of stopping Matt Forte, then Cam Newton rolls into town before the biggest game in recent Lions history: The Packers on Thanksgiving. With Jahvid Best currently out of action all the focus is on Matt Stafford and the redonkulous Calvin Johnson. If they want to win the division they’ll need to sweep November. It’s possible, but will take a lot of hard work and not a small dose of luck. 7 seems rather high given just how awful they looked against Jacksonville and then in the 1st half against Arizona, but while Joe Flacco and the offense sputters their defense is still a force to be reckoned with. Ray Rice gives the the Ravens a spark, and Boldin exploded in their recent comeback against Arizona, but if they can’t find any consistency it will be a tough road to the post season. This weeks battle against Pittsburgh, who they embarrassed in week 1, will put the winner firmly in the driving seat of the AFC North. Flacco needs to start showing he can put this team on his back consistently, cos Ray Lewis and Ed Reed won't be around for ever. But what happens when they go? The rollercoaster continues in Houston. Beat Pittsburgh one week, lose to Oakland the next. Fortunately for them the rest of the AFC South is to be found at the other end of this list. Arian Foster is showing he’s more than a 1 year wonder, while the offense and defense have kept ticking despite injuries to their best players, Mario Williams and Andre Johnson. This could just be the year they finally come through and make the play-offs. Or they could implode again. Anything's possible with Gary Kubiak. No one looks as bad when they lose as the Saints, then again few teams have looked as comfortable when winning. The defeat against the Rams should be taken as a blip rather than signs of a downward trend. The defense is creaking a little, but with Drew Brees at the helm and Sean Payton scheming the offense they SHOULD be ok. But they’ve got the Falcons and Bucs snapping at their heels and another blip is not an option. Not convincing in their win over Miami, but not to be discounted at 5-2. Based on their next 3 fixtures (@NE, @SF, vs PHI), they could quickly be at .500 again. And it doesn’t ease after that either. Eli Manning is currently 3rd in passer rating this season, thanks largely to the outstanding playmaking skills of Victor Cruz and Hakeem Nicks. Despite a 2 game lead in the division they are far from in the driving seat. The Bengals have had a great month. They hit the jackpot when Oakland handed them (potentially) 2 1st round picks for Carson Palmer. Their defense is playing at a high level while Andy Dalton and AJ Green look like they will bring plenty of wins to Paul Brown Stadium over the next few years. They’re a dark horse to make the post-season at the moment and still have 2 games against both Pittsburgh and Baltimore. It might be too soon for them and the play-offs, but you can expect the 2012 bandwagon to be busy. Someone’s kidnapped Mike Martz and replaced him with a competent coordinator!! The Bears have started playing a full-back, and keeping tight ends in to block. It’s amazing what a bit of time can do for Jay Cutler. We’d all forgotten just how easily he can launch a ball 60 yards when he hit Devin Hester for a long TD against Minnesota. As for Matt Forte? He’s been incredible, but the lack of a new contract will start to cause serious problems REAL soon. The Dream Team is almost back on track after an excellent performance against Dallas last week, but November poses some big challenges. The Bears, Giants and Patriots will make their turn-around difficult to maintain, but they definitely have the players to do so. The offensive line has improved and LeSean McCoy is probably the most exciting player in the NFL right now. But there are still holes in that defense that teams can exploit. Extremely inconsistent, but finally put together back to back wins before their bye week. Julio Jones’ injury pushed the offense back into its shell somewhat but he hopes to be healthy for this week. They’re still very much in the divisional race and can warm up vs the Colts before a key game against N’Arlins. The Jets have gone backwards from 2010, and it’s not been pretty. They can’t run (28th in the league) or stop the run (25th in the league). That’s the sort of thing that will expose Mark Sanchez and play Revis right out of the game. 2 games vs Buffalo and 1 against the Patriots this month will decide their play-off fate, but unless they can figure a way to get Shonn Greene going it won't end well for Gang Green and the continually big talking Rex Ryan. 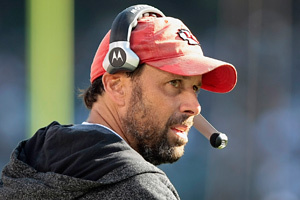 Does Todd Haley's beard have magically powers? Is there a less crazy explanation for KC's turnaround?? Their turn around has been remarkable. From 0-3 and looking dead in the water, and with their best 3 players all out for the season, the Chiefs have managed to put themselves right into the division race. Their defense is playing at a high level and the tandem of Dwayne Bowe and rookie Jonathan Baldwin is starting to look pretty deadly on the outside of the offense. Getting destroyed by the 49ers one week, beating the Saints the next. Jetting off to London with plenty of time to prepare, playing like a jet-lagged UFL team come sunday. The Bucs are the youngest team in the NFL, and they are playing like it. With youth comes inconsistency; that the Bucs have a wealth of young talent is undeniable. But until that talent is coupled with experience and a more mature understanding of the game, inconsistency will be the calling card of Tampa Bay. After Kenny Britt’s injury and Chris Johnson’s... Disappearance? Brainwashing? “Got my money so why play hard?” attitude? The offense has slowed considerably. They were in contention for the division for a while with the good play from Matt Hasselbeck, but after a crushing defeat at the hands of Houston you can probably kiss those thoughts goodbye. Toby was able to trade away Chris Johnson last week for a good return, but we doubt the Titans will be able to cut the strings so easily. Something’s not right with Phil Rivers. He’s said that he’s not injured, but the zip just isn’t there on his passes anymore. Meanwhile Antonio Gates’ continued injury problems are dulled by the fact that if he’s on the field, he’s drawing double coverage from most teams. They’re starting to waste their first good start to a season in a long time, and if they miss the play-offs again just how long can Norv Turner keep a hold of his job? Al Davis shuffled off this mortal coil, Jason Campbell’s shoulder shuffled out of its socket. It’s not been a great month for Raider Nation. But they’re still in the division race, which might explain why they gave up so much to get Carson Palmer. The only problem is Palmer’s not been good for a long time now and his arm strength is almost non-existent. This team will go as far as Darren McFadden and the defense can take them. A 34-7 win against St. Louis was followed by a 34-7 defeat to Philadelphia. The real Cowboys lie somewhere in the middle. Dez Bryant and Miles Austin have had trouble staying healthy, which lead to a lot of WR’s not really knowing where to be and what to run. 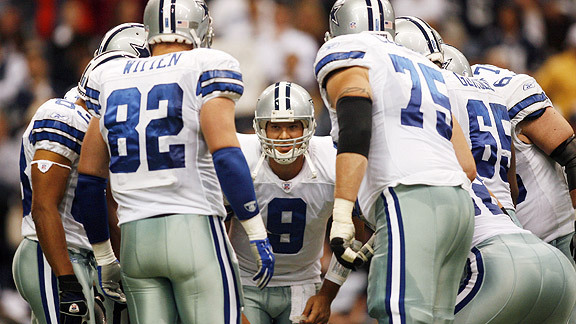 At times Tony Romo was having to push his players to the right position on the field. Rookie DeMarco Murray has done wonders when he’s been given the ball and DeMarcus Ware is everything we expected of him. Double digit sacks already and on pace to break the record. What started well has quickly crumbled. Rex Grossman exploded in a big ball of terribleness and John Beck, while not killing his team, hasn’t really done much. The injuries to Chris Cooley, Santana Moss and Tim Hightower hasn’t helped either. The defense, lead by the ageless London Fletcher, puts up a fight every week, but it’s a losing battle at the moment. Cam Newton is fantastic. Everyone at TPL, like a lot of experts, had our doubts and worries, but so far Newton is blowing every expectation out of the water. Yes he’s making mistakes, and yes he’s only won 2 games, but every game is a must see with him and a rejuvenated Steve Smith on the offense. They’ll worry teams every week now, but you can still move the ball on them, that’s next April’s priority now. 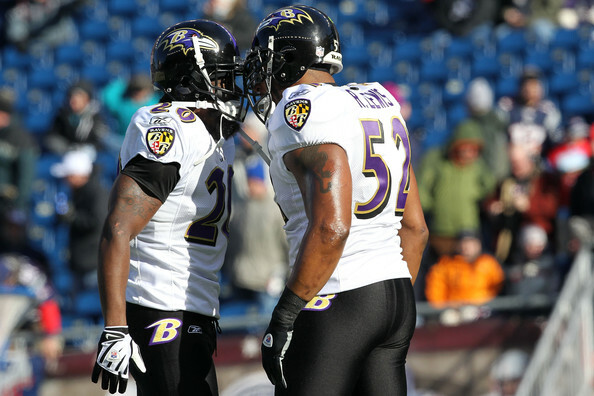 Like the rest of the AFC North they’re playing great defense. Unfortunately the ground game has been struck with the Madden Curse. Cover boy Peyton Hillis is going at just 3.5 yards a carry, with his back-up Montario Hardesty putting up just 3.3. And as much as we might like him, it doesn’t look like Colt McCoy has the stuff to be a starting QB in the NFL. Christian Ponder has shown a lot of promise in his appearances this season. He won his first start last week and the presence of Adrian Peterson obviously makes life easier for the rookie QB. Jared Allen is playing like a man possessed right now and is a serious threat to break Michael Strahan’s sack record. There’s light on the horizon for Minnesota after their horrible start. Their defense is playing really well, but Blaine Gabbert is starting to feel the strain of having very few weapons on the outside. They have the lowest scoring offense in the NFL right now and it’s making life very tough. They can expect a high pick to get Gabbert some help. Seattle, Tarvaris Jackson is back! You know it’s going to be a tough ride when you’re relying on Tarvaris Jackson to give you a spark. The Seahawks are playing stout defense but that just doesn’t help when you’re only going at 3.8 yards a carry. Will Pete Carroll be looking to renew aquaintances with USC’s Matt Barkley in April? The fans can only hope. After being ravaged by injuries the Rams notched their first win in a convincing display against the Saints. Maybe Steven Jackson’s renaissance performance had something to do with those beautiful throwbacks? The schedule eases now for St. Louis, and with Bradford on his way back there’s a good chance they won’t be this low come December and Phil can go back to enjoying his sundays. 6 loses in a row is not a good start to the Kevin Kolb era. And now he’s hurt. Fortunately Chris “Beanie” Wells is running well and running hard. Wonder if Larry Fitzgerald regrets signing that long extension in September. What’s that Larry? You do? We thought so. At least top pick Patrick Peterson is providing some spark with his electric punt returns. We put them down here because at least Miami have shown signs of life and a bit of pride. Indianapolis have been an embarrassment, and you can’t put all that on Curtis Painter’s shoulders. Apparently Peyton Manning still wants to play in 2011, I’m not sure why he would risk it. Unless he thinks his job is at risk from a certain Stanford wunderkind. for the defense this year.